Study at the cutting edge of integrated photonics research. We offer a 4 year PhD programme in Integrated Photonic and Electronic Systems. Before starting their three-year PhD, students undertake a one-year MRes course that allows them time to absorb the context of photonics research and to learn tools and methods that can support powerful, influential research. Applicants may apply for the MRes alone if they wish. Please visit the Programme Summary page of this website for more information about the programme and current work being undertaken by our students. 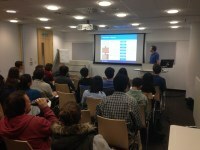 You can see examples of past MRes and PhD project titles here. Why apply to this programme? As one of our students you will join a vibrant and diverse community of academics and graduate students. We aim to deliver a broadly based, multi-disciplinary and demanding PhD training programme which will prepare you for your future career. On completion of the programme you will have expert knowledge in the area of integrated photonic and electronic systems relevant to your research project; project and programme management skills; teamwork, communication and leadership skills and the ability to seek optimal solutions to complex or multifaceted problems. You will be placed at either Cambridge or UCL where the Centre is led by world-leading academics assisted by industry partners and stakeholders providing a route into future employment in the rapidly expanding field of photonics research. You will receive a stipend in line with current EPSRC stipend rates tax free, plus UK/EU fees for four years (conditions apply). All students study at both universities – desks, IT and facilities are available to all Centre students at both Universities as required for their projects. Industry/user linkage a key aspect so excellent preparation for a career in industry and business. Each year we run an industry day to bring students together with industry partners who may be interested in offering research projects as well as career opportunities. Monthly seminar series (alternating locations) featuring talks from PhD students and guest speakers from industry or academia. You will be able to carry out cross-departmental and cross-institutional research. Applications are invited from outstanding UK graduates with a good first degree (1st or 2:1) in a relevant science (physics, mathematics, natural sciences, geology and geographical science, social sciences, materials science etc. ), engineering (chemical, civil, electronic and electrical, mechanical etc). Eligible EU and overseas students with these or equivalent qualifications may also apply. Applicants with other relevant qualifications or extensive relevant industry experience who can show evidence of a scientific and engineering research capability may also apply. Fully-funded Engineering and Physical Sciences Council (EPSRC) studentships for candidates who meet the eligibility criteria will cover UK/EU fees and provide a stipend, variable depending on location. Funding will normally be for four years but will be dependent upon the successful completion of the MRes programme, identifying suitable PhD supervision and upgrade from MPhil to PhD. We have funding available for UK and EU students eligible for EPSRC awards for students to start in September 2018. UK Nationals - UK applicants that have settled status* in the UK and have studied or worked in the UK for the past 3 years are eligible for full fees and stipend. * this means you have no restrictions on how long you can stay in the UK. ** EU applicants that do not meet the 3 year residency criteria are eligible for fees only support. *** applicants that do not have settled status may in some cases apply for general UCL/Cambridge overseas scholarships or self-fund their PhD. For more information see links to search for funding on the homepage. Please note we are unable to answer queries on academic suitability or funding eligibility prior to application due to the high volume of queries we receive. For further information on eligibility please see the EPSRC website. All home and European applicants must complete the Pre-Application Screening Form prior to making a full application to enable us to assess your suitability at an early stage in the recruitment process. The details you supply are held confidentially and will only be seen by staff at the Centre. It normally takes 4-6 weeks to update applicants on the status of their pre-applications. Overseas students may also complete the Pre-Application Screening Form in order to gain an idea of their chances, though they may also apply directly, without completing a pre-application, by completing the full application to UCL or Cambridge (see below under 'Apply for a Place' for links). There is a £50 administration fee to make a full application to Cambridge, but there is none for UCL. It normally takes 4-6 weeks to update applicants on the status of their pre-applications but direct applications may take longer to consider..
Overseas students who wish to apply for Cambridge or UCL may apply for the MRes 1 year course. On successful completion of the MRes, they will then have the opportunity to continue to PhD. If overseas students wish to apply for a Cambridge scholarship, they must do this before the deadline, which is usually in early December. Cambridge runs a quota scheme which means that only a limited number of offers will be made by Cambridge. Initial registration will be at Cambridge University or UCL. The course is identical whichever institution you are registered at. You may express a preference on the pre-application form, but the decision as to which institution, if any, will make an offer to you, will be taken by the Centre. Please note that the pre-application does not constitute a formal application. Following initial consideration of your pre-application, if there appears to be a good match between your background and qualifications and the objectives of the Centre and if you are a UK or EU applicant, fully eligible for funding, you will be invited to attend an interview in London or Cambridge. If you are an overseas student and your pre-application or formal application is strong enough, you will be invited to interview via Skype or by telephone, but not on site. For applicants who applied using the pre-application form, if successful in your interviews, you will be encouraged to make a formal application to Cambridge or UCL using the standard application form. Applicants choose to apply for a place at UCL or Cambridge. You must fill in and return an application form for the university you are applying to. For those who applied directly, using the formal application process, please see next step. A decision is made by the centre as soon as reasonably possible. The student is sent an offer letter from the supervisor, and a studentship offer letter from the centre. Upon signing the offer letters the student commits to the programme. An official offer letter is sent by their university, and when this is returned, the enrolment process begins, usually in the last week of September. The programme starts in late September with an induction week, held in both Cambridge and London.